It’s been a while since I decided to go on my journey to Nuremberg working for NETWAYS, doing more stuff with Icinga and get to know what I like most – work on a team with spirit and dedication, learning new things all the way and get the chance to join conferences & meetups. That was 2012, and it’s nearly 2 years already. 2 years where we finally released Icinga 2 after 20 months of development, sleepless nights, and still not stopping there. What really matters to me, is not the code, or the things we do. It’s the way we do it – professional, but with a love of fun, spontaneity and team work. Getting a drink together on Friday at 4pm, just because we like it. Going skiing together (where I come from), BBQ, XMas party, … there are countless ways you can join this lovely little family (did I mention we loved the spirit of #atemlos and used that for our #b2run slogan?). It doesn’t matter which dialect you’re using – even my Austrian slang sounds familiar these days. 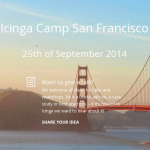 My work and dedication is now being honored by getting invited to San Francisco, joining my fellow colleagues and Icinga team members on the upcoming Icinga Camp. I am grateful for that, that’s something I never expected to happen after the huge success we already gained through our activities online & at various conferences. After my very first Icinga 2 Training last week with kind & positive feedback, it literally pushes my motivation to the next level. Still, I am an Icinga team member for 5+ years now, and it’s even more fun when you know that your work as a team (Icinga and Netways, that is) is still going strong.